The year 2019 may be a precarious one for US-China-Taiwan relations. Amid trade tensions between Beijing and Washington, Chinese President Xi Jinping announced on January 2 a warning to Taiwan that its independence tendencies would not be tolerated. Despite his largely conciliatory tone, Xi’s speech touched several sensitive nerves in global geopolitics. It is notable he delivered this discourse on the 40th anniversary of the Chinese government’s 1979 “Message to Compatriots in Taiwan.” Xi now likely pursues a hedging strategy against systemic uncertainties in the triangular diplomatic game. Gazing from Zhongnanhai, the Chinese leaders’ compound near the Forbidden City, Mr. Xi perceives three strong headwinds blowing in his direction, impediments largely originating from Washington. The first, of an economic nature, arises from an unpredictable president Donald Trump. Employing a team decidedly unfriendly to China, Mr. Trump has pressured Beijing to yield concessions on trade, intellectual property rights and market access. Trump has imposed import tariffs on $250 billion worth of goods, further threatening to apply tariffs on all remaining Chinese goods should the current 90-day truce expire in March. A second more troubling American gust derives from Washington’s security and strategic circle in the form of three key documents: the National Security Strategy of December 2017, the Summary of 2018 National Defense Strategy, and the Nuclear Posture Review of 2018. These all identify China as a strategic competitor and a revisionist power aiming to undermine US supremacy in Asia and across the globe. The arrest of Huawei’s executive in Canada upon request from Washington was an additional warning. Mr. Xi, of course, finds the rhetoric harsh and the posture aggressive. Yet the more menacing squall for Beijing consists of a third threat: Washington could play the Taiwan card. That would bring trilateral relations closer to Beijing’s red lines. 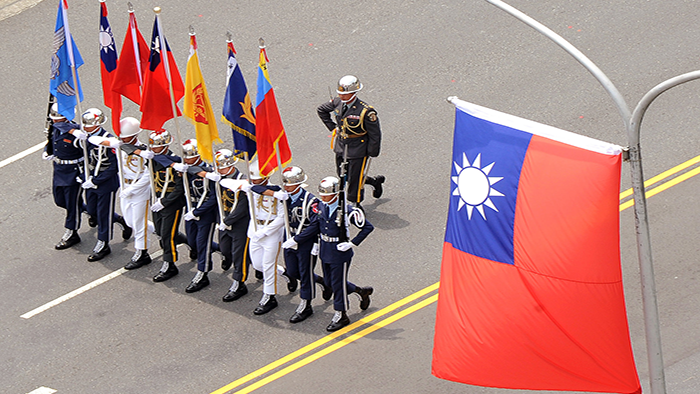 Beijing views Taiwan as an American pawn. Further, China fears that whenever the bilateral relations grow tense, Washington instinctively pulls Taiwan’s puppet strings. In fact, the Trump administration has recently adopted several pro-Taiwan laws, most notably the National Defense Authorization Act (2018), the Taiwan Travel Act (TTA), and the Asia Reassurance Initiative Act (ARIA). These are all designed to apply maximum pressure on Xi. As a result, Trump may now legally invite Taiwan’s President Tsai Ing-wen to Washington for a state visit or even order warships to dock at the port of Kaohsiung. Although Trump has yet to employ any of the new provocative tools authorized by these Acts, they remain in his policy toolbox. Beijing stands weary that when push comes to shove, Trump might evoke them. Amongst such stormy headwinds, Xi recognizes two electoral seasons yet approaching on the political horizon. While Trump’s possible reelection looms in November 2020, Taiwan’s general election is only a little more than 12 months away. Although the ruling Democratic Progressive Party (DPP) has just suffered a crushing defeat in the mayoral elections, Ms. Tsai has wide support in Washington as evidenced by the passing of the TTA and ARIA with no opposition. The impasse between Tsai’s administration and Beijing over “the 1992 consensus” vis-à-vis the One-China Policy does bode ill regarding Chinese support for Taiwan; accordingly, the pro-independence leader will tilt more, not less, toward Washington in coming months. To hedge against climactic shifts in Washington and Taipei, Xi took the initiative. Perhaps inspired by Teddy Roosevelt’s “Speak softly and carry a big stick”—or in Chinese parlance “Act tough and talk soft” (ruanying jian shi)—Xi projected considerable confidence in his New Year’s speech concerning Taiwan. True, his rhetoric recycled many past messages, including “Taiwan is an inseparable part of China” and “Chinese will never fight Chinese.” Nevertheless, Xi reiterated fierce opposition against Taiwan independence. The leader’s genial but resolute speech echoes strong sentiments most Chinese feel regarding Taiwan as an integral national territory. China’s first Premier, Zhou En-lai, once remarked to foreign dignitaries that Taiwan was China’s Alsace-Lorraine, that is, a region representing a deeply ingrained territorial dispute. Zhou identified the island off China’s coast as a major nationalist sore spot with good reason. After China suffered humiliating defeats during the Opium Wars, in 1895 Taiwan was then taken by neighboring Japan in yet a more painful blow. In short, the Middle Kingdom lost its traditional status as East Asia’s most significant nation to that of the Rising Sun. Fifteen years later, the shamed, failing Qing Empire collapsed, not unlike a defeated France yielding territory to Germany in 1871. Despite those similarities between Taiwan and Alsace-Lorraine, their nations future is greatly diverged. On the ashes of the Qing rose East Asia’s first democracy, the Republic of China (ROC). This weak and divided nation, however, quickly succumbed to more invasions from Japan. The Second World War, known as anti-Japanese war in China, witnessed a reversal between the two nations and a redemption of the humiliated people. China scholar Rana Mitter summarizes the Middle Kingdom’s position at the end of that conflict: “Nationalist China had been designated one of the ‘Four Policemen’ by Franklin D. Roosevelt and given a permanent seat on the UN Security Council.” Regarding territorial integrity and sovereignty, Chiang Kai-shek’s Nationalist government advanced Chinese interests at the Cairo and Potsdam conferences. The ROC ruled Taiwan with consent from its WWII allies the US, and the UK. Despite that, the transfer of Taiwan from Japan to the ROC occurred de facto but not de jure. This has proven a source of many of today’s disputes. The US dominated the process in the San Francisco Peace Conference of 1951, sidelining China due to the 1949 communist victory by the People’s Republic (PRC) and its later role in the Korean War. The Nationalist government relocated its Republic of China (ROC) in December 1949 to Taiwan per loss of that civil war. As a result, Taiwan is both in and out of China. It is “in” because Taiwan’s official name and its constitution include China and the “Chinese mainland area.” In fact, Taiwan refers itself as the “free area” of China. On the other hand, the preamble of China’s constitution stipulates Taiwan as part of its “sacred territory,” making it “the inviolable duty” of the leaders and populace to “reunify” the island. The unfinished civil war resulted in quantities of China’s gold reserve shipped to Taiwan; in fact, many Chinese national treasures and documents are still housed on the island. Virtually identical to the mainland claim, Taiwan’s Ministry of Foreign Affairs website has long insisted that “Taiwan is the territory of the Republic of China—this is a position absolutely consistent with history and international law.” This page was deleted by the ruling DPP administration in 2017. This is because they no longer perceive the historical claim of the ROC as encompassing mainland China, but have chosen to believe that the ROC is a separate nation from the PRC, one that essentially comprises Taiwan only. Except for that recent DPP aberration, both the PRC and ROC have historically included Taiwan as part of greater China; the area of disagreement has been whether or not the Communists or the Nationalists have the legitimate claim to rule that greater China. Yet Taiwan is also “out” of China, not the least because it is self-ruled and democratic. While its history as a colony of Japan ended at the end of WWII, it was not exactly returned to China (whether defined as the ROC or later PRC). It is controversial because the de jure portion was not addressed. As a belligerent during the Korean War, no Chinese government was invited to participate in the San Francisco Peace Treaty of 1951. This was the conference that legally ended World War II in Asia. The treaty stipulates that Japan voluntarily surrendered Taiwan, but it failed to prescribe a recipient. As a result, pro-independence leaders passionately argue that Taiwan’s sovereignty was not rewarded to either the ROC or the PRC; instead, it resembles Puerto Rico. That is, Taiwan could be viewed as territory of the United States by conquest of Japan in 1945. In fact, Taiwan’s ex-President Chen Shui-bian, the former DPP chairman, testified in court that he was “an American agent” during his tenure. One result of its “hanging” status is that the people on Taiwan are deeply divided in both national and personal identities. This became an electoral issue concomitant with Taiwan’s democratization since the 1990s. The DPP has benefited greatly from manipulating the identity politics during elections. Once DPP leaders are in office, however, they tend to adopt a more cautious approach, fearing repercussions to disrupt their rule. For example, the Tsai administration maintains an opportunistic position to describe the island and her regime. When its audience is the US and the international community, she uses Taiwan to refer to itself and to emphasize a distinct identity different from the government in Beijing. When its audience becomes the people on the mainland, it demands Beijing to face squarely the existence of the “Republic of China” as a legitimate regime. When its audience is people on the island, her administration adopts the ambiguous “this country” to avoid the ROC’s constitutional responsibilities to pursue unification. Further, she quietly had the MOFA webpage deleted, and also removed the content of the Cairo Declaration from Taiwan’s textbooks. Taiwan has played a strategic role in U.S. foreign policy since the 1940s—first it served as a buffer against communist expansion out of North Korea, and more recently it has been a bulwark against a rising China. It is strategically located along East Asian shipping lanes and could provide another naval resupply site if China continues to limit U.S. naval visits to Hong Kong. Keeping Taiwan within the U.S. orbit has served Washington’s interests by demonstrating that the United States will continue to engage in Asia, despite talk of a declining U.S. role in the region. The tragic result of this policy, however, has been that it has played into Beijing’s fears of encirclement and naval inferiority, which in turn has prompted China’s own military buildup. The PRC has issued five Messages to Compatriots in Taiwan since 1950, but the one on New Year’s Day 1979 proved the most significant. It marked a drastic change from a more militant approach to a more conciliatory one. Since then, Beijing floated the idea of the One Country Two Systems (1C2S) formula. Since 1992, it posited an even more accommodating “one China with respective interpretation” formula, the so-called 1992 consensus. That is, China attempted to further appeal to the Taiwanese people. Opinion polls indicate while majority of Taiwanese reject the 1C2S, they find the 1992 consensus more welcoming. Since the late 1970s, China has drastically increased its standing on the world stage. Despite its authoritarian government, one repeatedly accused of human rights abuses, Deng Xiaoping and his successors worked hard to modernize the Chinese economy and its military forces. In 1979 China’s economy stood less than 10 percent of the US; today it compares at nearly 70 percent as measured by market exchange rates. In fact, China ranks as the second largest economy. In terms of purchasing power parity, it has surpassed the United States since 2014. In military, science and technology, and even space programs, China has grown to be a reckoning force. In fact, only one day after Xi’s speech on Taiwan, China made the world’s first-ever landing on the far side of the moon. Even the US Defense Intelligence Agency released an unclassified 125-page report detailing some of the efforts Beijing has made to establish a world-class military force. It states that China’s “longstanding concerns regarding Taiwan independence” constitutes one of the motivating factors for its build-up. The result was indeed impressive. As Beijing pursued its “great national rejuvenation” it overtook Taiwan in essentially every measurable way. Across the Strait, Taiwan has turned the other way from a formerly prosperous leading Tiger economy. In 1990, its economy was nearly 50 percent of China’s; today it is less than 5 percent. Further, 40 percent of its exports are directed to China. While Chiang Kai-shek’s successors have democratized an island only 100 miles from Chinese mainland, they also weakened it through identity politics and short-​term thinking. As with some other democracies, Taiwanese politicians seduce the electorate in campaigns with short-​term sweeteners that lead to long-term pains. Military service represents just one example. Fiercely contested elections for high office have prompted politicians to reduce compulsory service time from three years to a mere four months to appeal to voters. Then, to try to make military service attractive, they launched an ill-advised “volunteer force” policy to replace conscription. They defended this in the name of improving professionalism. Such pandering to voters’ immediate, short-term desires has resulted in fiscal difficulties and a generation that does not take pride in serving the military. As a consequence, in 2017 Taiwan spent 47 percent of its military budget on manpower, seriously squeezing its capacity for weapons purchases. As one lawmaker put it, Taiwan’s future security challenge lies in that it “won’t be able to find enough soldiers” who are willing to fight for Taiwan’s autonomy or independence. In other words, to maintain Taiwan’s status Washington must be willing to do the heavy lifting. In sum, the result of the last forty years since the 1979 Message to Taiwan Compatriots is an imbalance in power across the Taiwan Strait. This provides the background for Xi Jinping’s renewed push for reunification, but unlike 1979 he now operates from a position of strength. While the majority of Xi’s speech was a recycle of past messages, there are some fresh points. First is the good news for those who fear a return to the militant approach of Mao era. Beijing remains committed to the peaceful reunification policy laid out 40 years ago. The second point is the proposal of a “Taiwan Plan” of the 1C2S. Xi’s speech indicates that the Taiwan arrangement will not be a China-imposed unilateral arrangement, but one allowing Taiwanese inputs. He welcomed all political parties and representative members of Taiwanese society to contribute to this “New Deal.” In 1979, when the fifth Message was issued, the 1C2S was barely a concept. Later Beijing negotiated with British and Portuguese governments to formulate the Hong Kong and Macao iterations. Xi’s speech signals the first time that he is planning to push for a Taiwan Plan under the framework of the 1C2S. Predictably, it will become the guidelines for Beijing’s Taiwan policy. Compared with the Hong Kong / Macao models, in which Beijing directly negotiated with colonial governments, the Taiwan arrangement could be more beneficial and progressive to all parties if done properly. The third point is directed to the United States. There is an internal connection between a more conciliatory Chinese policy to Taiwan and an improvement in US-China relations. Forty years ago, when the US switched its diplomatic recognition from Taipei to Beijing, the conciliatory Message was actually issued that same day. Beijing then recognized and still acknowledges the US as an important external factor in determining the process between Taiwan and China. Despite that reality, Xi projects a clear message for Washington: The Taiwan Plan of unification is to be negotiated by “family members.” Make no mistake, reunification is a Chinese domestic affair not to be interfered with by foreign powers. Of course, Xi might be posturing; in world of Realpolitik the US is not likely to stand down on Taiwan just because Xi politely asks. Regardless, the US would be wise to recognize Xi’s subtext that a heavy-handed response would not advance trilateral relations. When US-China relations are better, Taiwan is safer. The corollary: When bilateral relations deteriorate, Taiwan could be the first victim. Dorcas Wong and Alexander Chipman Koty, “The US-China Trade War: A Timeline,” China Briefing, January 10, 2019, https://www.china-briefing.com/news/the-us-china-trade-war-a-timeline/ (accessed January 16, 2019). The law passed both the House and the Senate with Unanimous Consent and was signed into law by President Trump in March 2018. For details, see “H.R. 535 (115th): Taiwan Travel Act,” https://www.govtrack.us/congress/bills/115/hr535 (accessed January 16, 2019). Congress adopted the law by Unanimous Consent. It became law on the last day of 2018. For details, see “S.2736 – Asia Reassurance Initiative Act of 2018,” https://www.congress.gov/bill/115th-congress/senate-bill/2736/text (accessed January 16, 2019). These dignitaries include French President Georges Pompidou and US Secretary of State Henry Kissinger, as recorded by Jean-Pierre Cabestan and Zhou Enlai’s personal assistant Xianghui Xiong. See Jean-Pierre Cabestan, “The Taiwan Conundrum” (165-190), In Charting China’s Future: Political, Social, and International Dimensions, ed. Jae Ho Chung (Plymouth, UK: Rowman & Littlefield, 2006), 178; Xianghui Xiong (熊向晖), “心中珍藏的往事” [Cherished memories from the Past], Peoples Net, July 18, 2018 http://www.myzaker.com/article/5b4ec17177ac64292d5abb35 (accessed January 16, 2019). Rana Mitter, “China and the Cold War,” In The Oxford Handbook of the Cold War, ed. Richard H. Immerman and Petra Goedde, 2013, http://www.oxfordhandbooks.com/view/10.1093/oxfordhb/9780199236961.001.0001/oxfordhb-9780199236961-e-8 (accessed January 16, 2019). “Constitution of the Republic of China (Taiwan),” Taiwan’s government website, https://english.president.gov.tw/Page/95 (accessed January 15, 2019). “The Constitution of the People’s Republic of China,” https://www.usconstitution.net/china.html#Preamble (accessed January 15, 2019). Charlotte Gao, “Does Taipei Still Hold Taiwan? Is [Taiwan] Part of the Republic of China?” The Diplomat, July 13, 2017, https://thediplomat.com/2017/07/does-taipei-still-hold-taiwan-is-part-of-the-republic-of-china/ (accessed January 15, 2019). Michal Thim and Michael Turton, “The Chinese Cult of Cairo and the Status of Taiwan,” The Diplomat, July 17, 2017, https://thediplomat.com/2017/07/the-chinese-cult-of-cairo-and-the-status-of-taiwan/ (accessed January 15, 2019). This author has met a number of pro-independence activists and learned their perspectives in various conversations in Taiwan. “Taiwan’s Jailed Former President Looking for a Loophole,” The Economist, Oct 22, 2009, https://www.economist.com/asia/2009/10/22/looking-for-a-loophole (accessed January 15, 2019). Yimou Lee, “For Taiwan youth, military service is a hard sell despite China tension,” Reuters, October 28, 2018, https://www.reuters.com/article/us-taiwan-military/for-taiwan-youth-military-service-is-a-hard-sell-despite-china-tension-idUSKCN1N20U3 (accessed January 9, 2019).